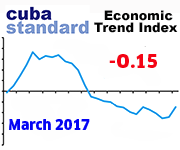 CUBA STANDARD — As the oil price has begun to climb out of the basement, on-shore exploration in Cuba is showing signs of life, and Cuba is readying another round of bidding for offshore blocks later this year, a couple of hundred oil and gas industry players are gathering in Havana this week to find out what Cuba has to offer. “We’re expecting between 150 and 200 attendees,” said Cristina Rivero, a senior marketing executive with IRN International, the UK-based organizers of the first Cuba Oil & Gas Summit. That number may include some 70 U.S. oil and gas industry executives, an outside source told Cuba Standard. The three-day conference begins Tuesday with two workshops at the Tryp Habana Libre hotel. Co-hosted by the state oil company, by far most panelists at the conference are Cupet executives or other Cuban officials. Scheduled speakers include Cupet General Director Juan Torres Naranjo, Deputy Minister of Energy and Mines Rubén Cid Carbonell, Cupet’s exploration chief, the head of the state company’s legal department, the head of the Cupet negotiation team, and more. The foreign panelists are Peter Stickland, CEO of Australian oil junior Melbana Energy Ltd.; the head of exploration for Canadian oil junior Sherritt International Corp.; the British ambassador in Havana; an official of Mexico’s energy regulatory commission; and executives of Barbados-based Latitude Energy Services Inc., Trinidad & Tobago-based Perfection Services Ltd., China’s BGP Multiclient, and of Brazil’s OceanPact. Two U.S. executives — John Hattner, senior vice president of Dallas-based oil consulting firm Netherland, Sewell & Associates, Inc., and a senior representative of Houston-based oilfield services giant Schlumberger — will be speaking as well. Jorge Piñón, a Cuban American and former oil industry executive, is skeptical about the degree of interest. “Cuba faces some challenges on their potential hydrocarbon resources, development efforts, primarily unproven geology, and low oil prices, as well as unclear OFAC enforcement of the embargo rules,” said Piñón, referring to the federal agency in charge of enforcing U.S. sanctions. The Office of Foreign Assets Control recently announced a fine of $304,706 for two subsidiaries of oil services company Halliburton, in connection with exports of $1.2 million in goods and services to a consortium engaged in onshore exploration in Angola that includes Cuba’s Cupet as a minority shareholder. Supplying Cuba with liquid natural gas, on the other hand, could be of immediate interest to U.S. players, suggests Piñón, who now heads the Jackson School of Geosciences’ Latin America and Caribbean Energy Program at The University of Texas at Austin. 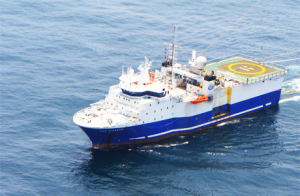 Even so, in hopes of spurring another round of exploration in the Gulf of Mexico, Cupet late last year contracted a subsidiary of Chinese state oil company CNPC for extensive offshore seismic surveying. 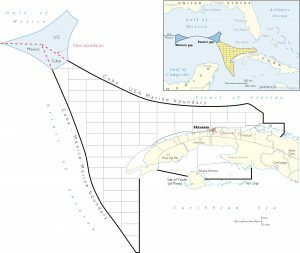 BGP Marine’s BGP Pioneer has begun a 2D multi-client survey in the Cuban economic zone of the Gulf, and the final results, covering 25,000 km of 2D long-offset, high resolution, broadband seismic and gravity data, will be available to clients by the fourth quarter next year, the company said. The survey will identify “prospective structural and stratigraphic trends that can be used for regional evaluation and future detailed seismic survey designs,” BGP said. The last exploration effort in 2012, with four drills by a deep-sea platform specifically built to comply with U.S. sanctions, ended up finding insufficient quantities of oil. 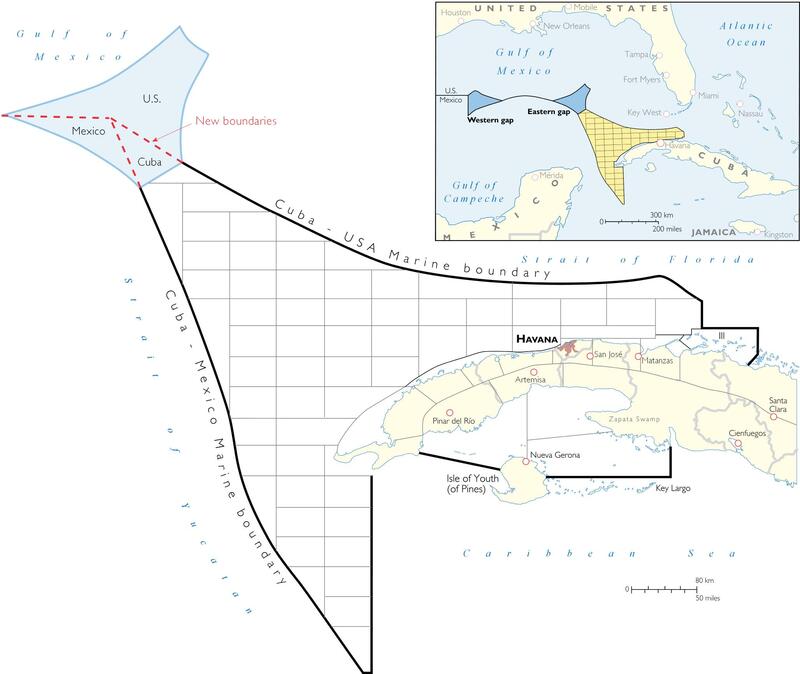 What’s more, on Jan. 18 — a mere 48 hours before the inauguration of the next U.S. president — the Obama administration signed a maritime border treaty with Cuba that fills the eastern “donut hole”, the last gap of international waters in the otherwise partitioned Gulf of Mexico. The agreement, which may have long-term effects on oil and gas production in Cuba, came after two rounds of talks between the United States, Cuba and Mexico that began in July. To be sure, the U.S. Senate, which is controlled by the Republican Party whose president is submitting Obama’s entire Cuba policy to a “bottom-up review”, must consent before the treaty is effective. Also, the Cuban part covers only an estimated 8% of the gap, and drilling there is a long shot, according to experts. There are no proven resource estimates within the area; it has not been explored, due to depth and complexity, and only a handful of exploratory wells have even been drilled in the surrounding area. Meanwhile, oil junior Melbana Energy Ltd. — formerly known as MEO Australia Ltd. — made a splash with announcements last year about substantial, high-quality oil findings in Cuba, as well as with a high-profile executive appointment. Melbana’s declarations have met skepticism by independent experts and total silence by official Cuba, which has left others puzzled. In late 2014, after three years of building trust and negotiations, the Melbourne-based company signed a production sharing contract with Cuban authorities for Block 9, a 2,380 square-kilometer area running from the eastern corner of the Bay of Cárdenas in Matanzas province to the western half of Villa Clara province. This is a block that has been well explored for more than 30 years by Soviet and Cuban geologists. The contract allows for an exploration time frame of 8.5 years with sub-periods to reach specific goals. In case of success, it may be extended for a total of 25 years. 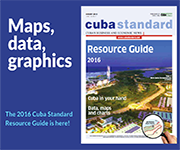 In September 2015, the company said it would begin an 18-month “exploration study phase.” But just nine months later, Melbana announced that the block contained 8.183 billion barrels, 395 million barrels of which would be “recoverable” — the equivalent of nearly seven years of Cuban oil consumption at current levels. What’s more, according to Melbana the first play contains “potentially high quality light oil”. That’s very different from the sulfur-heavy oil found in Cuba so far, which requires expensive refining. 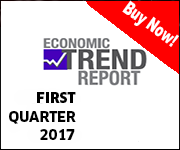 Since then, the company continued exploration in the other two, shallower, oil plays in the eastern areas of Block 9, with results expected in its fourth-quarter 2016 report. However, while specialized media around the world have reproduced the announcements, no reports are to be found in Cuban media; “officially”, the topic doesn’t exist. Some oberservers attribute the silence to cautious management of public expectations in a country that has gone through repeated disappointments with offshore exploration cycles. Melbana made ripples again in July, when it announced it hired the just-retired CEO and former exploration director of Cupet, Rafael Tenreyro, to head its Cuba operations. Even though the almost seamless transition of a Cuban state company executive to head the Cuba operations of a foreign company is unheard of, Cuban authorities apparently approved the appointment. This entry was posted on Saturday, February 4th, 2017 at 7:03 pm	and is filed under Top Stories. You can follow any responses to this entry through the RSS 2.0 feed. Both comments and pings are currently closed.